Do you worry that your daughter isn’t *quite* ready to move out? Does she know how to handle daily challenges without calling you in a panic? Although you’ve done your absolute best to prepare her for the “real world,” you worry that something has been missed. Of course you’re nervous- it’s a huge step in both of your lives! The truth is, your daughter is nervous too. It’s natural for parents and daughters to be nervous when it comes to moving out, but that doesn’t mean that your teen can’t be extra-prepared. That is where MissHeard Media, a media and live events company that empowers girls to be savvy, smart, and global, comes in. 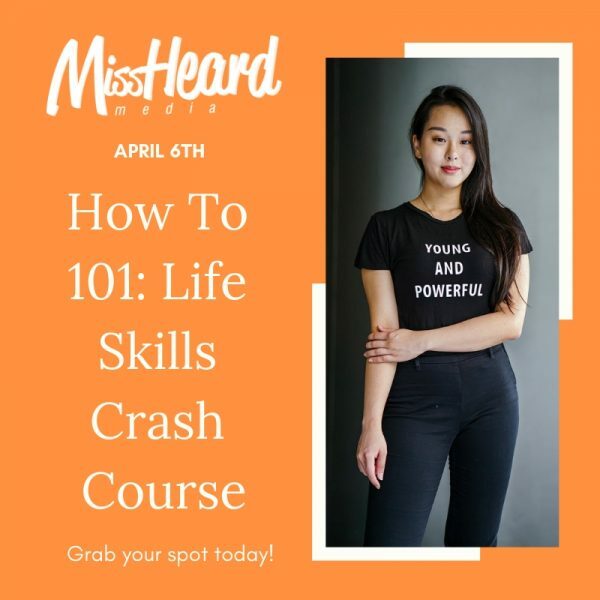 Register your daughter for the one-day MissHeard Media retreat, April 6th, 10:00a-4:00pm at Joe’s Movement Emporium, that teaches college-bound teen girls to navigate living away from home for the first time by re-affirming and practicing what you’ve already taught them at home! By the end of our time together, she will leave with a new set of ‘adulting’ skills, a take-home booklet, and increased preparedness and confidence! This event includes lunch, snacks, and small group activities, so space is extremely limited. Are you ready to give your daughter a boost as she steps into the real world?